When I was researching and writing A Journey into Michelangelo’s Rome, I read thousands and thousands of pages -- books, articles, interviews, journals -- and one name kept popping up in my research, that of Dr. William Wallace. 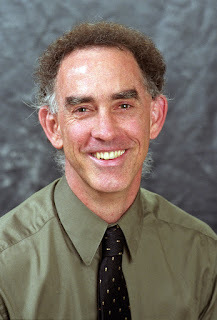 Dr. Wallace, a professor at Washington University in St. Louis, is one of the world’s foremost experts on Michelangelo -- a specialty which takes him to Italy frequently. He has just published a new biography, Michelangelo: the Artist, the Man, and his Times. It is delightfully readable and creates a fuller, more intimate portrait of the Renaissance genius. William Wallace: First of all, Italy has a wonderful climate, good food, and engaging people. That’s part of the draw. But the Renaissance, in scholarly terms, is “early modern.” The institutions and way of life are recognizably modern. Their banking, their politics, their basic ways of life aren’t so foreign that most Westerners recognize them without much work. And Renaissance Italy was a region of vast wealth, and there was a coincidence of tremendous talent and tremendous wealth which transformed cities like Florence into what we see now -- an outdoor museum. When we travel we go away to see the familiar -- the David, for example. We’ve all seen images of it, so we go to Florence to see it in person. But while we are there, we also experience the unfamiliar. So many people visit the Academy, where Michelangelo’s David is, and when they return they say, “I went expecting to love the David, and I did. But I was even more impressed by Michelangelo’s slaves.” The familiar introduces us to the unfamiliar in a way that is both challenging and comforting. AKN: Your new book, Michelangelo: the Artist, the Man, and his Times, draws on previously-untranslated letters that have been in archives and collections for centuries. Why has it taken this long to translate the writings of such a famous artist? William Wallace: Well, there are roughly 500 letters written by Michelangelo which have been translated. Irving Stone knew them and based his portrait of Michelangelo on them. But there are more than 900 letters TO Michelangelo which have only been sporadically translated. Drawing on those letters radically enlarges and enriches the picture of Michelangelo. The letters he wrote are rich and interesting, but he only wrote letters to resolve problems. So the portrait they paint, when considered in a vacuum, is of a complaining Michelangelo. A lot of emphasis has been placed on a few letters written in the midst of conflicts, largely with his family, and the picture has been a little bit skewed. But when taken in context with the rest of his correspondence and his financial records -- the untapped stores of information we have about him -- the portrait that emerges is much more complex. Michelangelo often, for example, would follow a direct or angry note with one that is tender and affectionate. AKN: Most Americans know Michelangelo’s story from Irving Stone’s book, The Agony and the Ecstasy, which is very dramatic, but not altogether factual. What is the greatest misconception most people carry about Michelangelo and his work? William Wallace: The popular image of Michelangelo has been that he was a difficult loner who couldn’t get along with people. In fact, he had a great cast of friends and family in his social network. And he had a great sense of humor. True, he was passionate and complicated, but most people know only a stereotype which could never be accurate. AKN: Michelangelo’s work has been in the news a lot in the last year with the Kimbell’s purchase of “The Temptation of St. Anthony” and the Met’s exhibition of “The Young Archer.” What do you think of these two works? Do you think they are really by Michelangelo? William Wallace: On average there is a new Michelangelo “discovery” every other year. I am approached four or five times each year to authenticate something as being by Michelangelo. Obviously, if it really is by Michelangelo, it is enormously valuable. These works make a big splash and draw lots of people to the museums, but generally they don’t survive on their own merits. In the last century not a single one of the “new discoveries” has been universally accepted as being Michelangelo’s work, and most disappear after a short while. The closest anything has come to being accepted is the wooden crucifix from Santo Spirito in Florence. But there are a lot of experts who are vehement that it is NOT the work of Michelangelo, and there is no universal consensus. As for “The Temptation of St. Anthony,” there is a great desire to round out Michelangelo’s biography -- to know what his work looked like before he was famous. I think it would be more appropriate in Casa Buonarroti in Florence. There it could hang with Michelangelo’s other student work [“The Madonna of the Stairs” and “The Battle of the Centaurs”]. Together with his walking stick and his slippers it could join the relics of the young and the elderly Michelangelo -- almost as if he was a saint. AKN: Technology is playing a larger and larger part in the art world – especially when it comes to authenticating pieces and determining their origins. For example, in the last few months a fingerprint was found in a small, overlooked painting. Now it is being attributed to Leonardo da Vinci. What advances in technology make you most excited when you see them applied in the art world? William Wallace: We must be careful not to be seduced by technology. It can provide more information, but it can also be a crutch, and information is not the end of the road. We still have to make subjective evaluations about art. There is no way to prove that the fingerprint in the painting is actually da Vinci’s fingerprint -- even if it matches fingerprints in other paintings by da Vinci. We still have to make value judgments. What is good and enduring in art still requires very subjective evaluation based on a lifetime of knowledge. Take the controversy some years back about Laocoön. This is all about interpretation, not proof. We could do some testing of the marble and find out where it came from. But it doesn't prove who carved it. There's no such thing as "proof" in the humanities. The real test will be over time. Does the idea that Michelangelo forged the Laocoön stick? Or does time simply prove that a fancy idea is a fancy idea and nothing more. We shall see! AKN: Rome or Florence? Which city speaks to you more? William Wallace: I have spent lots of time in both cities, but I lived in Rome with my children, and that’s where I spend most of my time in Italy now. It is a rich and fascinating city. But asking me to choose is like asking a parent to choose between their children -- I don’t want to choose one over the other! AKN: You spend a lot of time in Italy. Where do you like to stay and, more importantly, where do you like to eat? William Wallace: We always rent apartments now. We used to stay in Trastevere years ago. Now we stay in a great apartment behind Castel Sant’Angelo. But the great thing about Rome is that there are all kinds of apartments. You can stay in almost any neighborhood at almost any price. We also really enjoy the Prati -- a neighborhood north of Castel Sant’Angelo. The buildings are a little more modern. It’s a really desirable neighborhood. And the public transportation there will get you anywhere you want to go. We like to cook for ourselves so we aren’t eating out all the time. And every year we seem to gravitate to a new favorite. My rule for restaurants is to find one with both Romans and tourists in the same restaurant. If the Romans still eat there, the food is good. But if the tourists also eat there, then it has been recommended by someone, too. 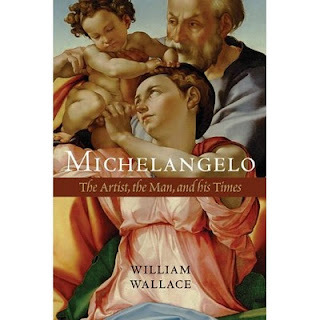 For those of you who are biography fans, William Wallace's new biography of Michelangelo is stunning, stirring, and fascinating reading! It isn't too heady or scholarly, rather it is a well-told story of a truly unique life. Very enjoyable! On Friday, I'll be giving away a copy here. But if you can't wait, you'll find Michelangelo: the Artist, the Man, and his Times in The Gypsy's Store. Very interesting interview, Angela. I will look forward to reading the book. Thanks for sharing!